Over at the New York Times is a fascinating article about Korean writers and enthusiasts of Japanese poetry - and the negative response their work often receives. The best known of the obscure group of Korean writers of Japanese poetry was Son Ho-yun, who died in 2003 at the age of 80. She had published six volumes of tanka, Japanese poems of 31 syllables, in Japan and had been invited to a New Year’s poetry reading at the Imperial Palace in Tokyo. Despite this, in 2005, when Prime Minister Junichiro Koizumi of Japan recited one of her poems during a news conference with Roh Moo-hyun, then South Korea’s president, most Koreans were baffled as to who she was. In the poem, Ms. Son dreamed of better relations between the countries. Once, a Korean editor who was invited to speak at one of her book parties humiliated Ms. Son by reproaching her for writing Japanese poetry. Now that's how to behave when you get invited to speak at someone's party! Where do people learn such behavior? It's not like they're reminded of the history between the two countries every day, is it? While looking for something else I came upon this page, which has scans of a 1919 Korean Red Cross pamphlet about the suppression of the Samil independence movement (which I talked a lot about here). It includes the declaration of Korean independence, 34 photos, and a statement from the Korean Red Cross. What's most remarkable are the photos, many of which I'd never seen before. The pamphlet says they were taken by a foreigner (singular), and one of them was most certainly taken Francis Schofield, so it would seem they came from his camera. I've included some below, but for those who want to see them all but don't want to spend the time necessary to look at them on the website, I made a pdf, which can be downloaded here (scroll down to bottom left). The photo below is well known - or at least the right half of it is. I made a panorama from two separate photos. To the left is Deoksu Palace (with some sort of awning set up - perhaps for Gojong's funeral) and to the right is the old city hall, a building I know nothing about. The caption for this photo says it's in a "corner of the park". 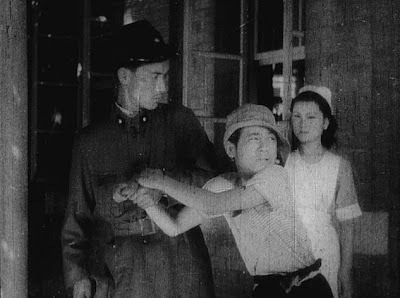 Below are women being taken to the police station for shouting "Mansei!" 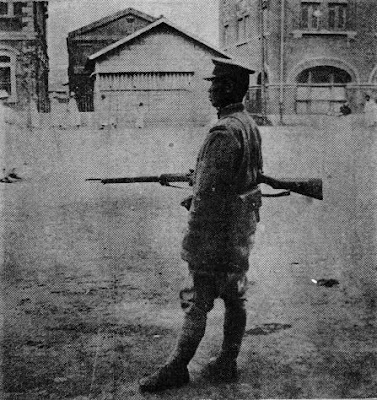 The caption for the following photo reads: "Japanese soldiers dot the streets of Seoul and other important cities in Korea like flies - one Japanese soldier at an interval of five houses." Shopkeepers stayed closed in solidarity with the demonstrators. 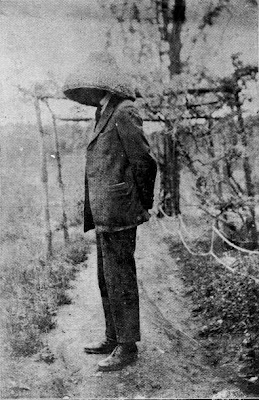 The photo below is of "A foreigner who was arrested for harbouring Korean revolutionists on way to trial with his head covered." Perhaps this is Eli Miller Mowry, an American missionary who was arrested and sentenced to 6 months in prison. 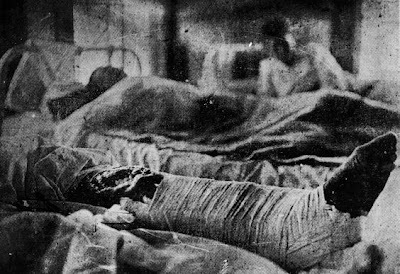 Schofield, working as he did at Severance Hospital, would have had many chances to photograph those beaten and tortured by the Japanese. The following two photos are are very unpleasant, just to warn you. 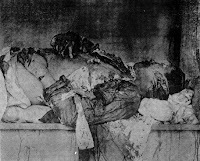 These are about half of the photos of the wounded, and they really do make clear how brutal the repression was. 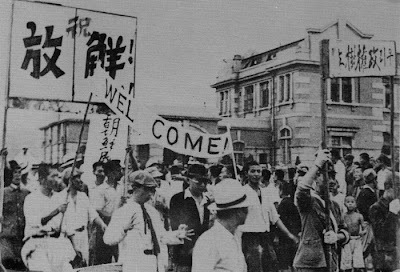 Schofield hid his papers about and photos of the uprising in his false leg when he left Korea, if I remember correctly, because the Japanese were trying everything they could to stop images such as these from leaving the country. 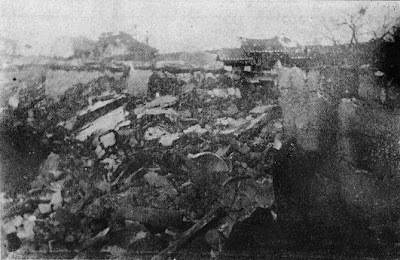 Below is a well known photo taken by Schofield on April 18, 1919, three days after the Jeam-ri massacre. 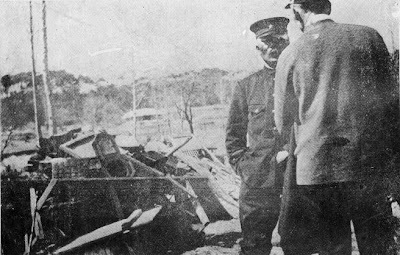 A Japanese police officer is explaining away the burned houses to a foreign missionary. Above are two grieving widows. Below is one of the only houses left standing in Jeam-ri. 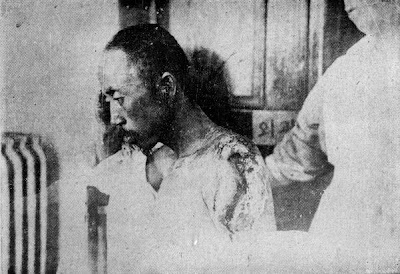 I've seen photos of Koreans tied to crosses at their executions, but have never been sure such photos were real. 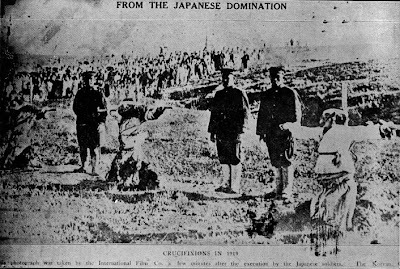 Here is one from the pamphlet which is captioned "Crucifixion in 1919: This photograph was taken by the International Film Company a few minutes after the execution by the Japanese soldiers." So what it's saying is that the Japanese, who were trying so hard to make sure no photos of atrocities left Korea so as to influence the west, let a foreign film crew photograph crucified prisoners? I'm not saying this didn't happen, I'm just saying I'd need some more proof. At any rate, it's a fascinating pamphlet, as I'd never seen most of these photos before. 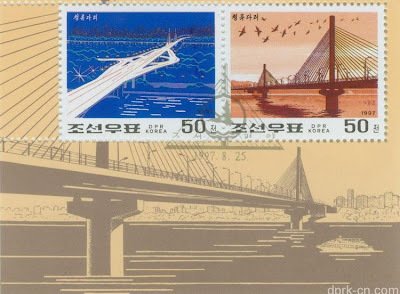 It seems pretty certain it is the bridge (which is, I believe, the newest one in Pyongyang), though the perspective is wrong and the blobs under the bridge look nothing like piers. Was the artist who worked on the cap one of the people who worked with Guy Delisle? Perhaps I should have known - North Korean propaganda isn't typically very subtle, is it? 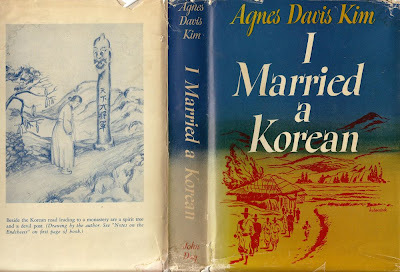 I looked briefly at the book "I Married A Korean" in my last post. The author, Agnes Davis Kim, described the American occupation of Korea, which I've transcribed below (I've looked at that period before - the photos come from this site). The author's husband, David Kim, worked for the Office of Civil Information. 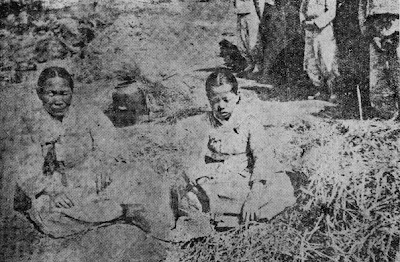 They had previously lived near Seoul between 1934 and 1940. I think this is an interesting chapter, as it looks at different issues (thieving refugees, the behavior of the occupation troops) from both points of view. 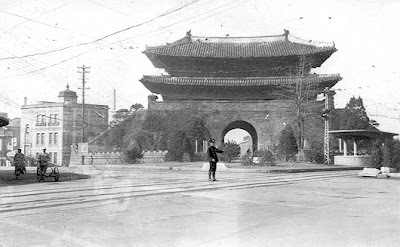 "Korea under the conditions which existed at the time of the United States occupation was almost unbelievably different from the Korea I had known the first six years after my marriage. During those years, although we and all Koreans were constantly conscious of the power and supervision of the Japanese over our lives, the country was law-abiding and went peacefully about its work. The people, trained in the old Confucian morality, were quiet, courteous, and dependable – even the most illiterate. The dignity, conscientious attitude and earnestness of nearly every Korean I knew led me to feel that a Korean was a born gentleman. Many of those who knew Korea best felt the same way. But when we arrived in Korea after World War II, everything was different. Through years of hunger and privation, the very nature of Koreans seemed to have changed. The calm dignity and courtesy which had marked them as a gentle people had given way to a defensively aggressive attitude that was often discourteous. Instead of a peaceful, law-abiding atmosphere in which everyone felt secure, the people lived under a constant threat of being robbed of what little they possessed. At night, a man might load his “jiggie” or cart with farm produce to take to market in the morning, only to find it was gone when he awoke and prepared to leave with it. Jars, pans, clothes left on the line to bleach, or anything removable what was left out at night, might be gone in the morning. This was almost unheard of happening during the pre-war days." "Careful investigation the next morning revealed nothing missing, and we concluded that if any thieves had been around they had been scared away by the shot. But when David’s nephew drove his father and mother into the city later in the day, a near accident disclosed what the thieves had been after. One of the jeep wheels rolled off and the ar skidded to a stop with one axle dragging. The thieves had been after the jeep tires, and had partially loosened the bolts preparatory to taking off the wheel. The stealing of automobile parts was so well organized and so bold that it was dangerous to leave a car parked and unguarded for even a few minutes. Beggar children were taught to steal lights or small parts almost under the eyes of observers. Anything left in a car for even five minutes was taken from it. I lost all my winter clothes after having them dry-cleaned during Christmas holidays. David left them for only about two minutes, but in that time, the glass of the window was broken, the door unlocked by reaching through the hole, and my clothes made off with, and nor a trace was to be found. Before the aggression from North Korea was initiated, some ten million people had fled from the north into South Korea. Some of these were members of our family clan. They had owned small plots of land on which they could grow enough food to feed their families and enough to sell to get money for their other needs. Most of the refugees had not been large landowners, but poor though self-supporting farmers. Their land was taken from them to become state-owned property. These refugees tried making Korean souvenirs, food, or anything they could sell to earn enough money to exist. 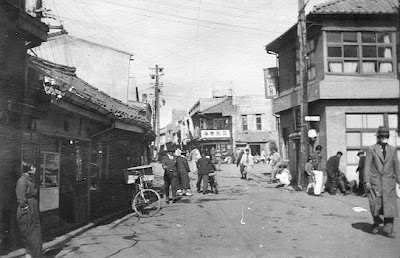 In most cases they had been hard working, law abiding folk before the division of Korea and the setting up of the Communist regime which had driven them from their homes. 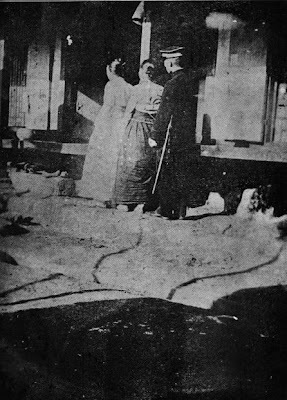 Relief organizations of the missionary group as well as the military government tried to help them with used clothes from America, food and, wherever possible, tents or other forms of shelter. But there was not enough to go around. 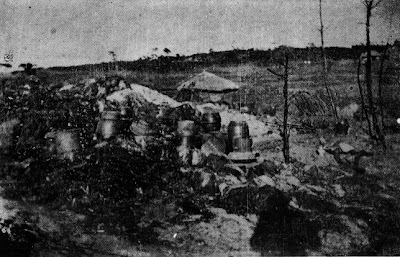 Many had to gather bits of wood, pieces of tin cans, old cloth and straw rice bags which they pieced together to form rude shelters to keep out some of the snow and rain. But these were open, had no heat, and all the cooking had to be done outside over an open fire, no matter what the weather was. 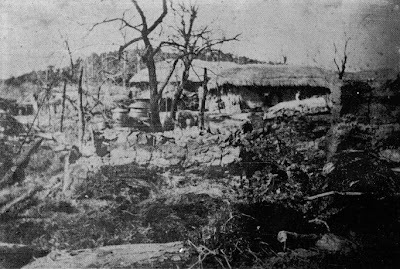 The people in these huts had to sleep on the ground, under inadequate rags or stiff straw bags for covers, and that winter was a very severe one. How they could keep alive under the hardships they had to endure is a miracle. Of course many did not. Is it therefore surprising that under the suffering that circumstances beyond their control had forced on them some of them took to stealing to get enough to keep body and soul together? 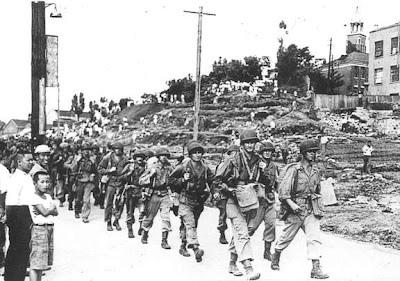 The attitudes of many of the young American soldiers in the occupation army did not contribute to the happiness and good feelings of the Koreans. Some of the G.I.’s were very good to the Koreans and treated them with respect, for they realized the Koreans were not a conquered people, and Americans were there to protect their interests. Unfortunately, many G.I.’s failed to realize this, and too often their attitude was one of contempt, or even viciously threatening. One day as I sat in the jeep waiting for David I saw a Korean trying to sell little home-made Korean dolls dressed in bright native colors. He asked several groups of G.I.’s to buy while I sat watching. Several times they looked at him scornfully and struck the dolls from his hands as they passed on, but when he lifted his head, his eyes followed them with very evident hate. I sat there ashamed of the actions of my countrymen. Incidents of such a nature were all too frequent. On that day I was taken to the hospital, the G.I. who drove the ambulance raved at the “damned gooks” and tried to scare them by swerving as close to them as he could without actually hitting them. “Gook” was the term of contempt used be nearly all G.I.’s. I protested tagainst the attitude and actions of the ambulance driver, pointing out that after all this was their country and we were merely temporary visitors. But he declared that all “gooks” were stupid fools who never watched where they were going. I am sad to say that this was the most common attitude that I observed among G.I.’s. This feeling came from the fact that for years under the Japanese, Koreans had been accustomed to look for traffic coming from the opposite direction, because with drive controls placed on the right side in cars, Japanese cars drove on the left side of the road. Americans had changed the traffic rules, but the habits of years could not be so quickly changed by the Korean people. Many Koreans were killed by American cars, and too often this was when they became frightened and confused by the contemptuous yells and swerving of cars by the American drivers, like my ambulance driver. But one could not help feeling sorry for the young American soldiers. The rules of discipline with regard to freedom, especially with regard to the association with Koreans, were very strict. The hours of duty were often strenuous, because there were not enough men to carry out the many assignments. Guards at the Office of Civil Information told me that they were assigned to duty every other four hours of the day, with four hours of sleep between their tours of duty and seldom a day off. G.I.’s, resenting this, too often took out their resentment on the Korean people. But if only they had realized it, their contacts with Korean were more important for building up the attitudes towards America and democracy than any official ambassador sent by the American government. It was tragic that the actions of our young soldiers, many of them only in their teens, should have marred the admiration and friendliness that had been so strong right after the liberation. 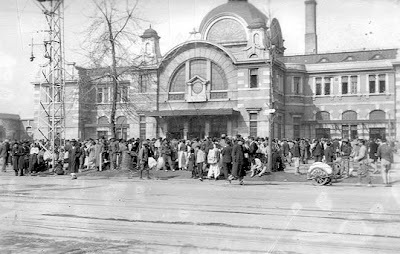 Where food and clothing have been supplied, or other help of individual needs, Koreans have been very grateful, but the railroad equipment brought us criticism rather than gratitude. If we consider the circumstances from their viewpoint, this criticism is easily understood. We sent $75,000,000 worth of railroad equipment all right, but it was antiquated and without spare parts for repair. The engines broke down so often that many of them were junked on the scrap heap as useless. The best of them had to be relegated to switching in yards, because they were not equal to the task of pulling trains. Is it to be wondered that Koreans said, “If Americans really want to help us, why do they send us their old worn-out stuff? Why don’t they spend the money on an even smaller amount of new equipment that would really be useful, and not this junk that is so aggravating because it is always breaking down and hindering us rather than helping? Whatever the deal was by which such discarded equipment was sent to Korea, it was not only a futile expenditure of the American taxpayer’s money, but it created resentment in the minds of Koreans. I knew a number of American civilians who had been sent out to work on constructive programs. For instance, in the agricultural improvement program, there was a very able man sent as an adviser. 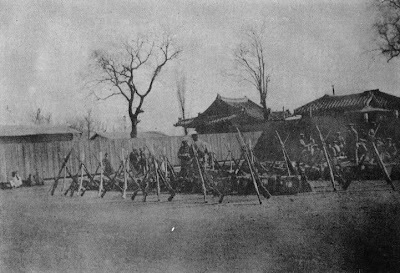 After surveying the situation, he recommended that the farm organizations left be the Japanese, whose Korean personnel were already trained to carry out such work, be utilized by the Americans. They could simplify and speed up the program, as well as save the extra cost of training and organizing a new group. But the military would not hear of using the exiting setup. In fact, they worked out not only one of their own, but two, one through the countryside and one through the university. Again, a man who was an expert in organizing co-operatives was brought to Korea, but instead of being allowed to do the work he had come to do, he was put at a desk to do clerical work. He resigned and went back to the United States. The cost of starting from scratch on programs for rehabilitating the Korean economy was much greater than utilizing existing organizations would have been. 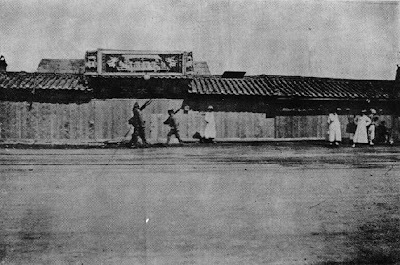 And using American techniques in an Oriental setting was not as effective as the plan worked out by the Japanese. Our experiences during the 18 months we were in Korea under the army of occupation convinced me that individual contacts with people and the attitudes which those contacts produce in the minds of people under such occupation, or anywhere in fact, are more important than money or material help offered. Money and gifts do not buy friendship. Only friendship sincerely offered, respect and consideration can gain the friendship of a people. 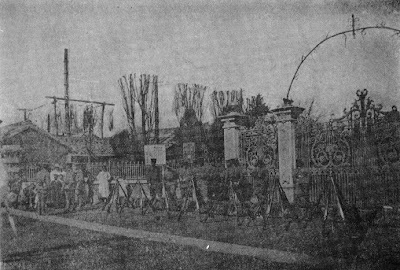 In spite of the cruelty and persecution inflicted on those who would not follow Communist orders, the manner in which the Russians treated those who were persuaded to follow them and be trained and indoctrinated in Communist ideas built up a friendly allegiance towards Russia and communism. Treating their followers with respect and restraint was a strict rule observed by the Russians and was maintained as a means of spreading their propaganda. The effectiveness of teaching democracy and American ideas in South Korea was counteracted by the unfriendly attitudes that Korans met from so many Americans. The examples of drinking and loose living set by too many of the officers families, the attitude of superiority displayed by so many Americans – these too reduced the respect and good will of Koreans toward America, if they did not kill it altogether." "A short time before we left Korea, a jeep carrying a Russian officer and a Russian woman came along the road near our house, and turned off on the road leading across the valley. That night, and for several nights afterward, a brilliant light flashing dots and dashes came through our bedroom window and awakened me. Being suspicious, I reported it to the American Intelligence Section of the army, and they sent a man out to watch and report on the light phenomena. He found the signals were a code with a definite time pattern. Whatever was done about this, I do not know, but a few nights later, the light disappeared. A little while after that an irregular lard grinding noise took its place – a sound we had never heard before. I reported this also. 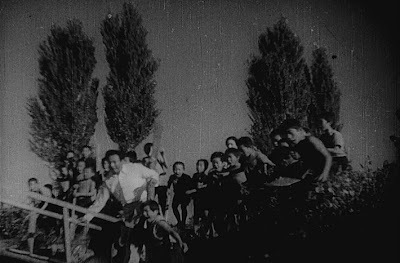 A few weeks before we were to leave, the anti-communist group formed among the villagers to discover any communist activities got wind of a plot to waylay and kill David on his way home from work. The anti-communist group lay in wait for the would-be assassin, and he was captured and turned over to the police, who imprisoned him. David was earmarked for assassination because of his anti-communist information work among Koreans, in connection with the training for democracy which he carried out with the Office of Civil Information." When I was at home over Christmas my mom mentioned a book she'd read as a kid titled "I Married A Korean," so when I was at my grandparents I looked through the bookcase and found it. It proved to be a fascinating read. Agnes Davis Kim met her future husband David Kim (we never learn his Korean name [Update - Chuhwang Kim - 김주황]) when he was studying in the U.S.. After a 6 year engagement, (during two years of which her fiance was in Korea), she sailed to Korea with several crates of belongings in 1934 , staying there until 1940. They luckily left before the Pacific War began, and in the U.S. her husband's language skills proved useful to the government, so he eventually joined the O.S.S. and served in China. 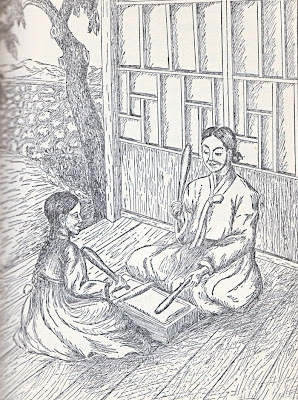 As he was sent to Korea to serve in the U.S. occupation forces there, she eventually returned to Korea with their son, staying there between 1946 and 1948. While the process takes a long time, two women often share in the pounding, chat on all kinds of topics which interest them, or work out intricate rhythms that make the ironing fun. Certain rhythms have come to have special meanings. Fascinating. Also worth noting is the fact that, without she and her husband's efforts to operate a school and medical clinic, the farming families around them would have had no access to education or modern medicine. Considering that they lived very close to Seoul, it certainly makes me wonder just how much the Japanese did to improve education and health care in areas outside of the cities. This book was originally published in 1953, but a 1979 reprint by the Royal Asiatic Society is described here. Also worth noting is that on her voyage to Korea she describes her conversations with John Patric, who would later go on to write a book about his adventures traveling in the Japanese empire called "A Yankee Hobo in the Orient." I managed to find a little information about this book and its author before realizing it was first published under the title "Why Japan Was Strong," which can be read in part at Google books. Pages 28-32 tell part of the story of the time he spent with her on the ship, and page 31 is well worth reading for a laugh. What's also interesting is that she told him only that she was marrying a missionary, though he would learn more about their marriage when he later traveled to Seoul. This book may prompt a few posts; for now I'll start with her chapter on the American occupation of Korea in the 1940s. 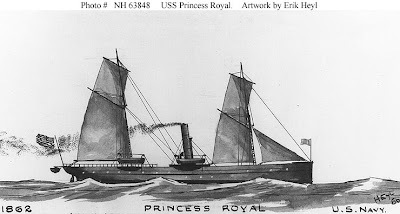 Here is a photo of the USS Princess Royal, taken from this Wikipedia entry. Strangely enough, it doesn't mention that after it was renamed the General Sherman and turned into a merchant ship, it was sunk on the Taedonggang, the river that flows through Pyongyang, in 1866 (as the entry on that incident relates). Worth remembering, of course, is that North Korean historians claim an ancestor of Kim Il-sung was the leader of those burned the ship. 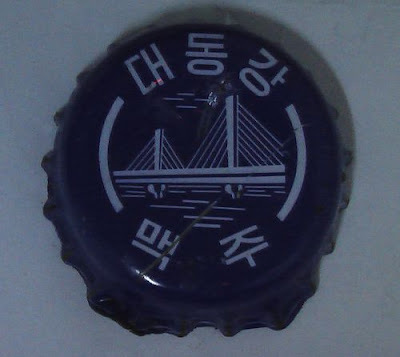 Here is the beer cap from a bottle of Taedonggang beer, made in North Korea. Notice any similarities? The General Sherman is literally on the Taedonggang. Subtle, yet it gets the point across. Does Taedonggang have the honor of being the world's only anti-American beer? Besides Molson Canadian, I mean? I was reminded of the beer cap after reading this post at DPRK Studies about Taedonggang beer, which mentions that it's no longer available in South Korea. It's possible that the beer made for export (in a 500 ml bottle at 5%) was better than the domestic stuff. I drank the beer made for export two or three times, but also drank a bottle of the domestic stuff a friend brought back from Kaesong (which comes in a 650 ml bottle at 4%, and is seen in the brewery photos at DPRK Studies) and the latter did not compare favorably with the former. 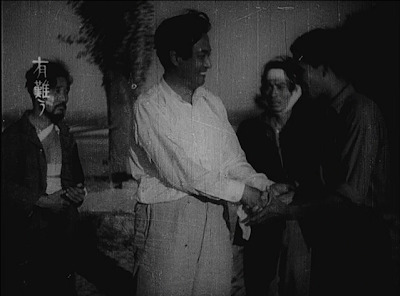 A while ago I wrote a post on the 1941 film Volunteer, which was included in the box set "Unearthing the Past", which Mark over at Korea Pop Wars first brought to my attention. 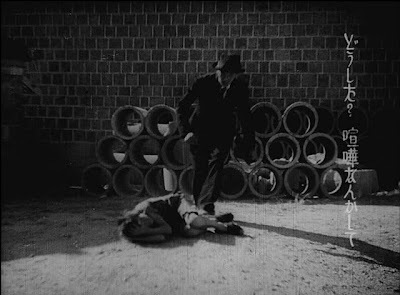 I finally got around to watching another film in the box set, Angels on the Streets ("Homeless Angels" is the direct translation). A synopsis and discussion of the film can be found here, which tells us that it is "based on the real-life story of the boys who lived in Hyangrinwon, Bang Soo-won's home for vagrant youth located just outside Kyeongseong in Hongje-ri." 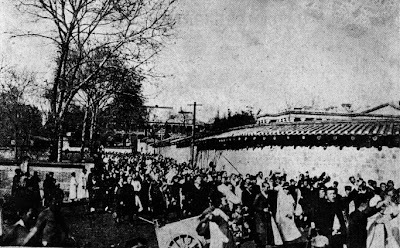 Hongje-ri was likely where present-day Hongje-dong is, which is in Seodaemun-gu north of Yonsei University. 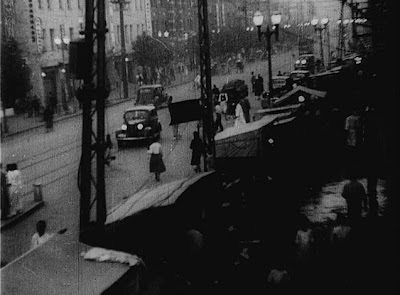 The location of the Hyangrinwon in the film appears to be in the Banpo area, as they have to cross the Han river to reach downtown. 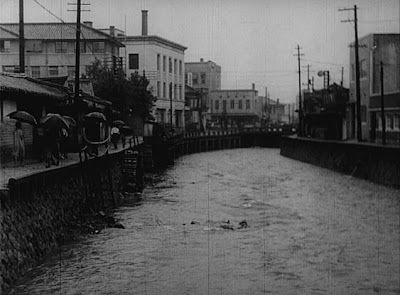 Perhaps the stream above is Cheonggyecheon, but it's worth remembering that there were dozens of streams in Seoul that were covered up in the twentieth century by both Japanese and Korean governments. The story begins as a sister and brother who are selling flowers on the streets enter the tavern seen above, where a kindly, drunken doctor gives them money without taking a flower. When the sister allows the brother to buy some taffy, their minders catch him and take them 'home'. Exactly what the situation is between this disreputable group and the siblings isn't entirely clear, but it's obvious they are in the group's debt (perhaps they even 'belong' to them). 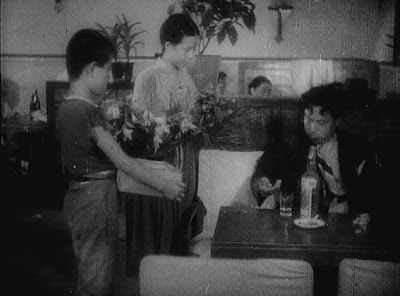 The sister is cajoled into working in a 'bar', with the promise that they'll withhold punishment from her brother. Her brother instead escapes. He then is rescued from a beating by the kindly Bang Seong-bin, who takes him to his house to stay with the small group of rescued street children already living there. The kindly doctor from the beginning turns out to be Bang's brother in law, who helps Bang set up a home for wayward boys. Bang finds another recruit for his home when a boy tries to steal from him, and he saves him from being dragged away by the police (a Korean police officer, mind you). The doctor takes in the sister as a nurse, and she is eventually reunited with her brother before the boys have to fight off the hoodlums who come to get them back. Though it's all rather tame today, the conditions the street children live in, and the fear the boy shows as he's being grabbed by the police officer, for example, do not really reflect an entirely happy colony. 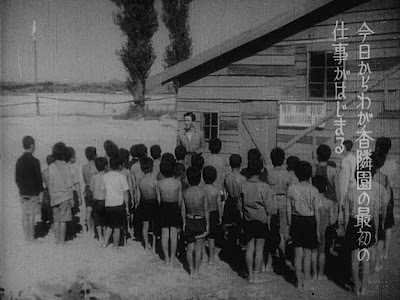 Near the end, there is a scene in which the film's characters recite in Japanese a pledge of allegiance to Imperial Japan. This scene constitutes a critical flaw in recognizing Homeless Angel as a representative film in Korean cinematic history. 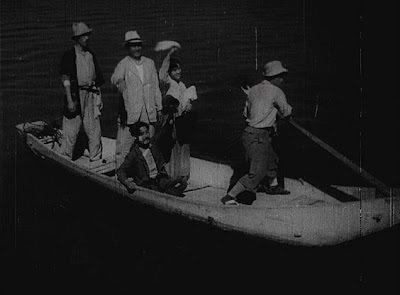 Nevertheless, the reason why KOFA cites Homeless Angel among the 100 representative works of Korean cinema is because it is one of the very few surviving movies from the Japanese colonial era. 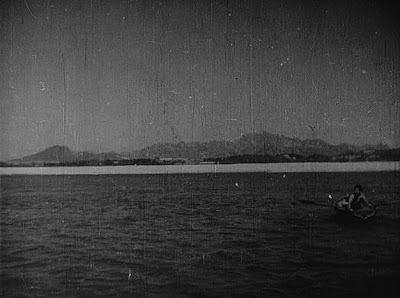 Indeed, the fact that the propagandistic sequence is inserted irrespective of the plot and thus does not pose a substantial threat to the text's actual subject, as well as the fact that the film shows the highest level of sophistication among contemporaneous works, both contributed to its inclusion on the list. [T]he propagandistic sequence is inserted irrespective of the plot and thus does not pose a substantial threat to the text's actual subject. 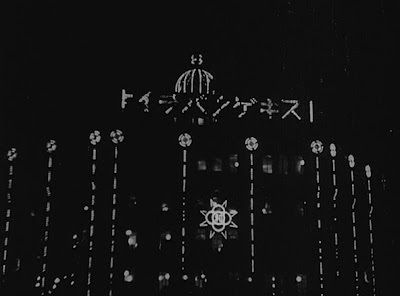 Let's remember that this film was made in 1941, after Japan had been at war with China for 4 years, and then see if anything else in the narrative could be seen as being militaristic. 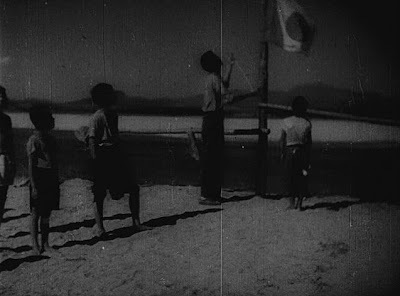 After Mr. Bang has arranged for living quarters for the boys, he and his family move to their new home in the countryside with the boys, who fall in behind a cart and walk in a line single file while the lead boy plays a martial tune on a bugle. After arriving at their new home, the boys work outside. 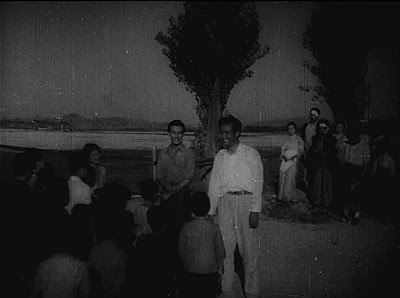 In the photo above they are cheering and pointing at an airplane flying overhead. They are awoken in the morning by a bugler, seen here juxtaposed with the flag in the background. Upon rising, Mr. Bang has them assemble and talks to them. If you want to suggest they look like they're just at school, it's probably worth noting the degree to which militarism affected the school curricula and organization at that time. They're later taught how to take apart and reassemble a machine gun. Just kidding - they're taught how to make noodles with the press brought to them by Mr. Bang. 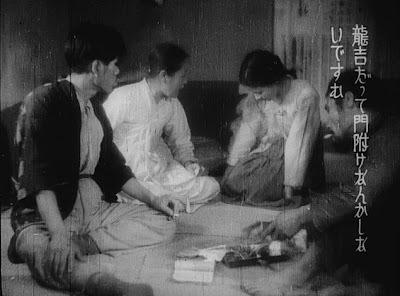 That said, the pro-Japanese moment (which lasts three of the last six minutes) is worth having a look at. We are citizens of the great Japanese Empire. We are loyal with all our heart to the Japanese Emperor. As citizens of the empire we train to become an excellent and strong citizen. Another young boy recites their daily creed : "Honesty, courage and love." Thus ends the propaganda sequence. 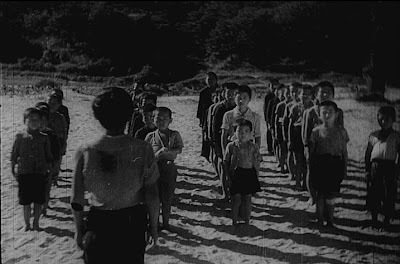 The point at which they leave for their new home is just over twenty minutes into a movie with a running time of 1:13, and from that point until the last six minutes (when the pro-Japanese moment appears), there are several scenes at the boys' home which suggest militaristic organization. 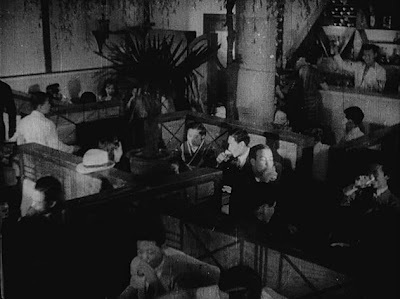 That said, and after looking at the photos above, does the propaganda scene actually seem so out of place? The epilogue is actually almost as fascinating as the "propaganda sequence". After hearing the boy recite the daily creed, the kindly doctor applauds and approaches the boys. "At first I thought you were all incurable. My mind was set that you were impossible to help. But today I am actually ashamed of myself". Speaking of one of the boys, he says, "When I first saw him, I thought he had an evil mind and I thought he would never act like a decent human, but today he did a good deed. I am very happy". To help his friends, one boy "sacrificed himself". "I was glad for all of you. You are here to become excellent people. And trying hard to become one by listening to your teacher. Do you know whose effort all of this is? Pointing to the man who has provided for them, this is [his] power of love. I believe you are the happiest children. You are all trying hard to become a great person, and it's all because of [him]. Now that the whole world knows about this, and the media is raving about it all around the country, I'm very happy. It's now that [his] great power, his great work has finally bore fruit. So now listen well to [his] words and become a great person. I hope you will be of great service to our country." The first thing I thought of when I heard that speech was, "What would happen if you replaced the boys with "Koreans", and their teacher with "the Emperor"? My mind was set that you [Koreans] were impossible to help.[...] "When I first saw [them], I thought [they] had an evil mind and I thought [they] would never act like decent humans, but today [they] did a good deed.[...] I believe you are the happiest children. You are all trying hard to become a great person, and it's all because of [the emperor]. 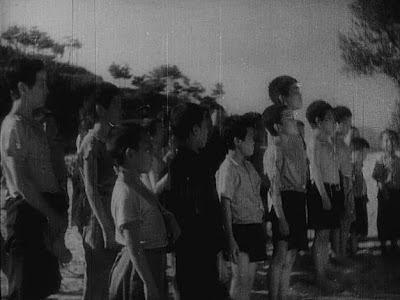 I think with that speech, it becomes pretty clear what the boys are supposed to represent, and just how much of the movie is imbued with a militarist spirit. Is it just me, or does the doctor look like Kim Il-sung? 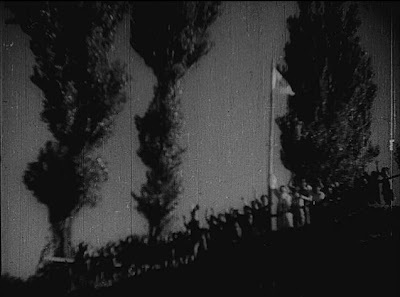 The children wave goodbye as the troop ship boat departs, the flag fluttering in the air above them. 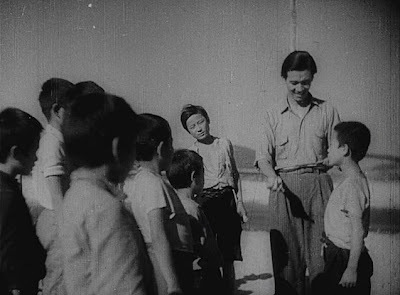 To put it simply, the propaganda in this film is not just limited to the last six minutes, "irrespective of the plot," but is actually embedded in the plot and is a part of the "text's actual subject." 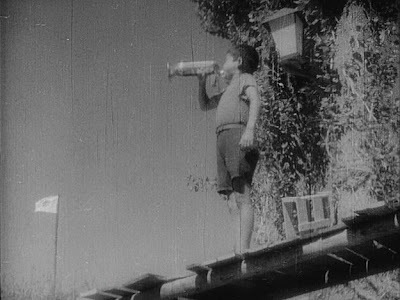 The director would make up for this by directing his 'liberation trilogy', the first film of which, 1946's Hurrah! For Freedom, is available on dvd.